We appreciate every single contribution made and enjoy providing our supporters with many opportunities to aid in the on-going care and maintenance of Cocker Spaniels through the efforts of Cocker Spaniel Resources. If you are so inclined to be able to help in any way, here are several options that all benefit our on-going efforts. Supporting CSR by supporting our Surgery and Recovery List is a very special group. Because these animals many times have immediate and sometimes life affecting needs, this area is dedicated to promoting and receiving financial support directly related and specific to these special animals. view our roster of needs here. Consider sponsoring one of our beautiful animals. With your generosity a sponsorship can provide food, medical attention, care as well as for everyday supplies and needs. Your charitable contributions are always tax-deductible. Learn more about becoming a CSR Sponsor here. Every Walk for a Dog counts, whether it’s a walk around the block or a three-mile hike. Magnify your impact by sharing the app with your friends and family. Consider making a personal gift to CSR right through the app. CSR is thankful to have received Vacuum cleaners by being a part of the Bissell Pet Foundation. We appreciate their efforts to continue working until every pet has a home. Sit a Dog, Save a Life™ lets you raise money for local dogs in need by doing something you do already… asking your friends, family and neighbors to watch your dog while you travel, instead of leaving him in a kennel! Find a loving dog sitter in your city and help save lives. CSR has partnered with Kuranda Dog & Cat Beds – Whenever someone purchases a Kuranda Bed here through our link Kuranda will donate 10% of the sale back to CSR!! It’s the best of all worlds – your pet gets an awesome Patented “Chewproof” design, off-the-floor comfort, exceptionally easy to keep clean bed and CSR gets your support!! Donate your old cell phone, PDA, digital camera, or iPod to be recycled and benefit our Cocker Spaniels! All donations to Cocker Spaniel Resources goes directly to help rescued Cockers. Donate via our page on recyclingforcharities.com or drop them off locally at Croix Valley Veterinary Hospital, 655 O’Neil Rd, Hudson, WI 54016. You can also bring donation items to CSR events or submit them to any CSR volunteer for donation. We take: cell phones, iPods, pagers, hand-held TV’s, tape recorders, and anything else that is hand-held and electronic! We also take ink cartridges and toner cartridges. Our organization needs your help. For every purchase made on this site Flower Power Fundraising will give 50% back to Cocker Spaniel Resources, Inc. Our annual Fall Flower Power fundraiser has begun. Your purchase of bulbs/flowers helps our Golden Age Cockers receive needed care. For every purchase Cocker Spaniel Resources receives 50% of the sale, which means 50% of your purchase is TAX deductible!! But hurry the fund-raiser ends October 15, 2014. Shop for yourself and Support CSR! BigDogBoutique ♥’s rescues and donated to our organization. Feel like treating your Cocker Spaniel to something especially made for them? BigDogBoutique.com has a great assortment of Cocker Spaniel specific related merchandise as well as a host of products for all types of breeds. 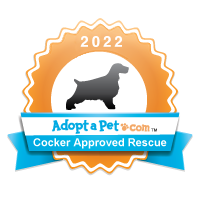 Support our cocker rescue efforts when you search the web. Go to GoodSearch.com and pick who you want to help. Fill in: Cocker Spaniel Resources (Hudson , WI) and we’ll receive a donation every time you search. Like saving money with coupons? Or enjoy playing games online? GoodSearch also helps you earn money for your cause when you shop and game through their services. Check out these other great GoodSearch options to support us as well. Thundershirts are helping shelters and rescue groups across the country to manage the dogs and cats they receive with anxiety, fear and excitement issues. Your Thundershirt Donation will be put to excellent use helping to transition one of our wonderful dogs and cats back to a forever home. Dedicated to Ending the Suffering in Wisconsin Puppy Mills Through Public Education. Educate yourself and be informed on how you can help.